Social business and social entrepreneurship offer an exciting field for empirical and conceptual management research. Yet, while there are many attempts to define either social entrepreneurship or social business, the boundaries and overlaps of both phenomena often remain vague or contested – thus rendering empirical or conceptual learning more difficult. We propose a three-dimensional definitional framework to define social business and social entrepreneurship, distinguish them, and relate them to each other. Our framework interprets the pure forms of both social business and social entrepreneurship as the two-dimensional combination of a pure social mission with either pure financial self-sustainability (social business) or a pure innovation focus (social entrepreneurship). Since the finance and innovation perspective are distinct yet independent dimensions, we derive and illustrate four cases of how social business and social entrepreneurship may but need not overlap. Challenging the assumption that each dimension is confined to two dichotomous values, we then interpret each dimension as a full spectrum and introduce the idea of mission, finance, and innovation hybridity. Our discussion suggests that multidimensional hybridity is the empirical rule rather than the exception. 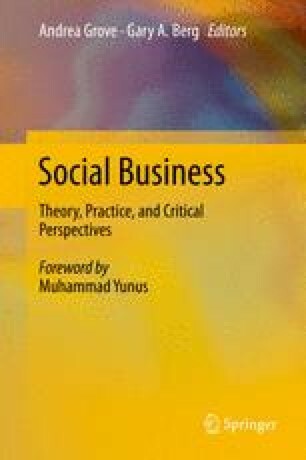 It is for this reason that the study of the pure forms of social business and social entrepreneurship promises particularly fruitful insights for management research. We conclude with implications for future management research.